During these discussions of vacation video editing techniques, I've frequently mentioned pacing, mixing of shots, background music, and narration. Titles seem so mundane and obvious that perhaps I've neglected them. So here are some thoughts about titles you've seen in the chapters from my Asia Cruise DVD. Many scenes have explanatory titles that are placed at the bottom of the screen. These are called "Lower Thirds", and are a great way to orient/educate your audience without interrupting the natural pacing and flow. 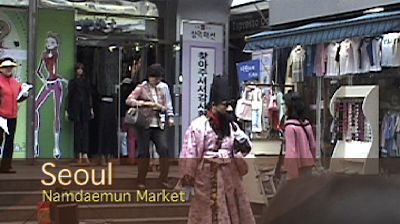 For instance, anyone who watched the video chapter from Seoul, Korea heard me try to narrate the name of this marketplace. 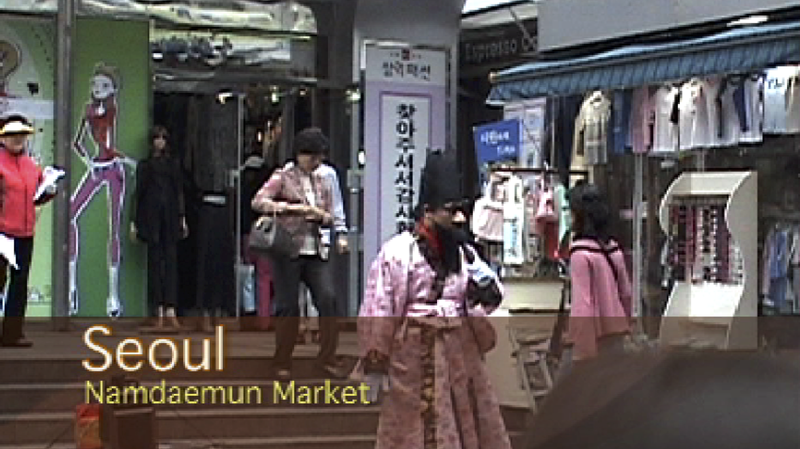 "Namdaemun" is quite a tongue-twister, but with this title the word becomes quite understandable. Titles are infinitely customizable; you can change styles, colors, and fonts at will! But I recommend maintaining consistency within each project. For instance, viewers of the Asia Cruise DVD quickly become used to seeing lower-thirds like the one above. The video is short; a simple farewell narration with a just few still photos and titles. The airplane moving across the map was done with Apple's Keynote presentation software (today I would accomplish the same thing in Final Cut Pro X). Andy Warhol's iconic portrait of Mao was found on the Internet. Auld Lang Syne played by a traditional Vietnamese band is not something you want to hear everyday, but it was a reasonable choice to end the DVD. Note: I trimmed closing titles and credits from the end of this video for the purpose of Internet privacy. In the unseen credits I named and acknowledged all of the music artists, and thanked those who appeared in the video chapters. I also placed my own copyright claim at the very end. The conclusion is often anticlimactic. Keep it short. We walked from the cruise ship terminal to a commuter rail station, and enjoyed a half-hour ride from Incheon to downtown Seoul. The capital of Korea is a thriving, vibrant place. This video depicts a huge variety of fun things that can be experienced just by walking around! The video starts out with a stupid gag -- I could't resist inserting a scream from James Brown every time the "Godfather of Seoul" hears the name of his city! Other sights and sounds include wedding processions, protestors' hip-hop, the raucous shopping district, horrible food, and a canary on the subway. There were some good original video clips to work with, which simplified my job as an editor. I focused on pacing, mixing shots (establishing, medium, close-up), titles, and sound balance. If you need a wide-angle or close-up clip, but forgot to shoot one, done forget that you can use one or more still pictures as a substitute. This video contains a few bars of identifiable music that is regrettably used without permission. The cruise ship was our hotel in Shanghai for two nights. We had a great time behaving like tourists. This video has some great clips, including: the chop-a-magic demonstration guy; riding the MagLev and commuter trains; the Oriental Pearl Tower elevator announcement; and pigeon-on-a-stick. There's one subtle editing trick I'd like to point out. At the 5 minute mark we return to the ship where a dixieland band is playing Midnight in Moscow (in the style popularized by Kenny Ball & His Jazzmen). The ship begins to execute a dramatic U-turn on the Huangpu River, there's some narration, then the music becomes a dramatic operatic version of that same song. Unfortunately there's a small hitch in the soundtrack, but I think this has the makings of a professional-style edit! My goal is often to create a three-minute vignette. After ruthless cuts and edits, this chapter is twice that long. It could easily have been six hours of boring nap-time video, but the pacing, narration, music, and content seem to flow well and entertain the audience. I narrated this video in a very straightforward way. There are a few wisecrack gems buried within the script. Wonder if I should add a laugh track? This video contains identifiable music that is regrettably used without permission. Nagasaki was the target of the second atomic weapon used at the end of World War 2. We were pleased to see the vibrant welcoming city that has emerged from the ashes. This video chapter is a longer production compared to other elements of my Asia Cruise DVD. There's a nice narrated introduction that establishes the location, then we quickly move to the memorial peace park. Admittedly this section feels a bit "preachy" but I was honestly moved by the visualizations of tragedy and hope. Music by Martin Denny marks a change of pace, bringing a humorous look at baseball, food, gambling, and toilets. It's more-or-less a video montage of the sights and sounds of modern Nagasaki. Then the video ends with a nice view of the Peace Fountain whose water jets form the shape of angel's wings. As the editor, I know I'm biased. But I really like the way this chapter turned out! It's OK to have a social message. In this case I tried to shape it so that it fit within the less-than-serious nature of the rest of the project. Perhaps the peace message is meaningful enough to stand alone as a shorter YouTube video. Kagoshima is the southernmost major port in Japan. Chiran, a village in the nearby hills, is home to an airstrip that was the launch point for many kamikaze pilots' final journeys. The cruise ship was welcomed by a Taiko Drum corps, which provided some excellent video footage as well as a great three-minute soundtrack. Our visit to Chiran is illustrated with still photos since the camcorder batteries were drained. Once again the narration provides some concise thoughts about the region's history. Make sure your batteries are charged. But just-in-case the video opportunity fails, remember that still photos can save the day! We've written about this before -- don't just think about the video that's being recorded. Live sound lends credibility to your production. Taipei is the capital of the island nation that calls itself the "Republic of China". We took a short tour in the morning, and then took a meandering "self-guided" walk in the afternoon. The video starts with a geography lesson, that plays very well as an establishing scene. Medium and close-up look at the honor guard is well done. I like the comments about food, and the concluding scene of the "Disabled Motorcycle Entrance" at a hospital. In my opinion it's a pleasant 3 min 45 seconds, that stands alone or fits well as a chapter within the DVD. Pleasant is good! Keep your vignettes tuned-in to the theme of the overall project. The narration provides a concise and informative bit of history.